This quiet backwater venue is a great place to get away from it all. Out on the edge of the Migneint moorland there is a delightful sense of isolation. The circuit features problems mostly in the lower to mid grade range. 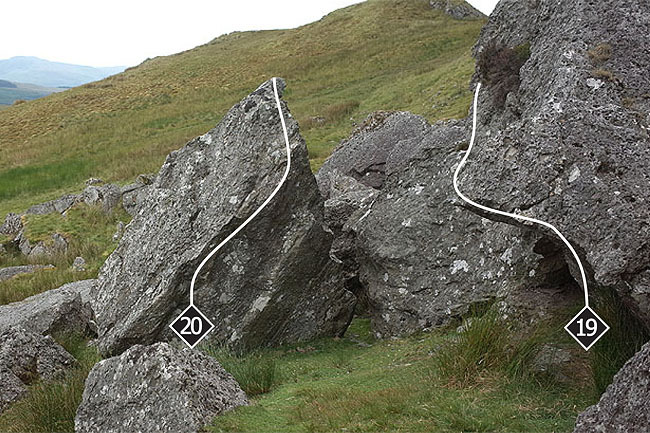 The rock is rough and pocketed; in fact it can be a bit sharp in places – make sure you take some finger tape to patch up the inevitable flappers and cuts. 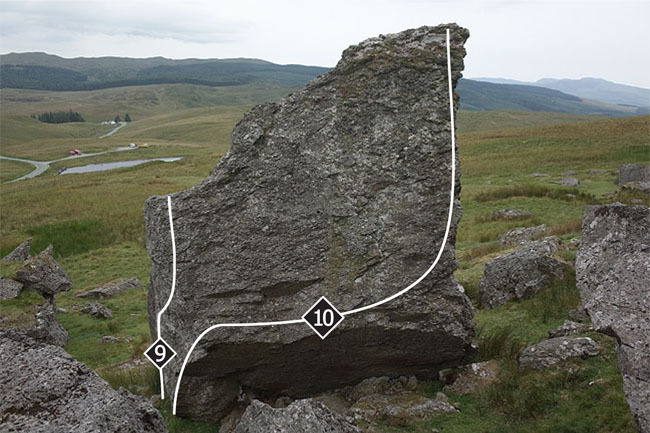 The landings are generally okay, but do require some care in the main boulder field. Some of the problems are highball but there is plenty to do at a less scary height. Conditions: The rock is mostly quick drying, however the shady facets hold lichen and are much slower to dry out. Year round climbing is possible, provided the sun is out and it’s not too windy. That being said the crag is exposed and situated at a relatively high altitude so wrap up warm if you’re making a winter visit. 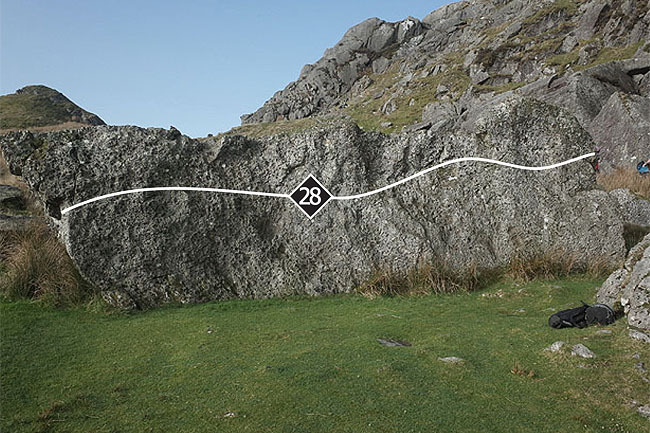 Approach: The crag and boulder field is clearly seen from the Ffestiniog – Penmachno road. There is a small parking area on the southern shore of Llyn Dubach. Approach directly on the obvious footpath (which can get a bit boggy during rainy periods). 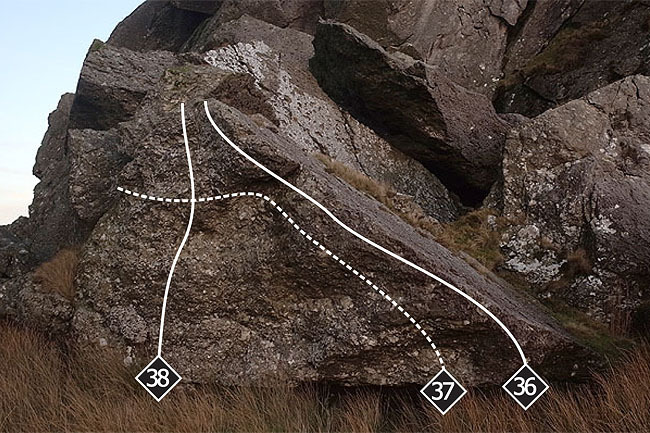 The circuit starts over on the right side of the boulder field on the Pen Ci boulder. Slab right of arête; there is a possible escape off right onto the mossy slab. Climb the arête on its right, slabby side. There are lots of positive holds but if you do dismount be careful to jump clear of the ankle-threatening ledge near the bottom of the arête. Tackle the bulging face left of the arête. 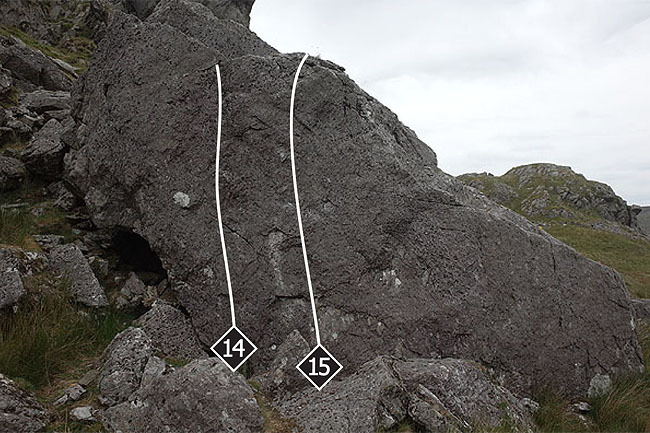 The obvious weakness in the centre of the west face of the boulder. 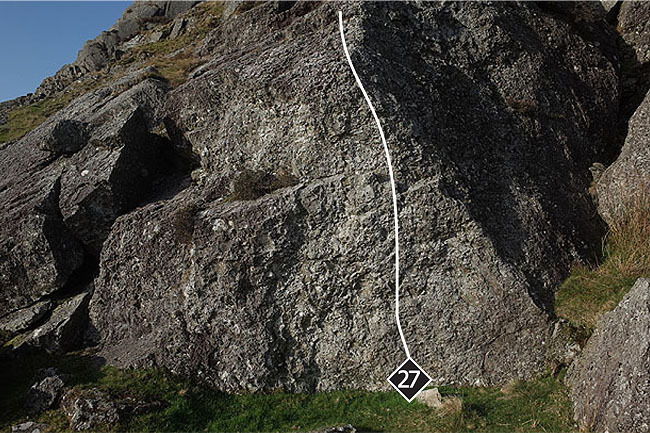 The prominent Dark Side block has a number of highball lines on the sunny side and some steeper action on the shady, corridor side. 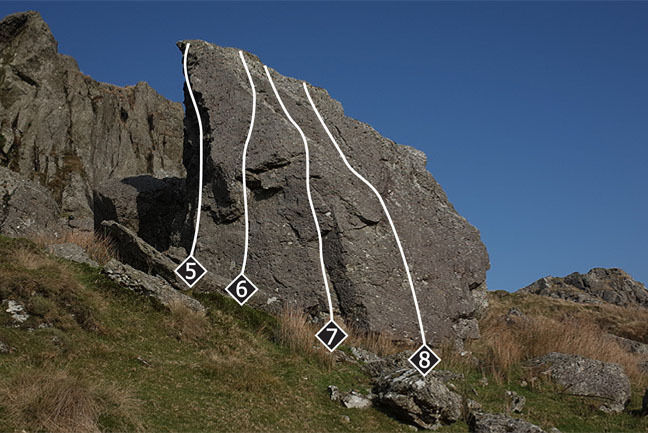 It is worth bearing in mind that the easiest way off the top of the boulder is to down climb one of the sunny side highballs, Problem 7 being perhaps the friendliest option. 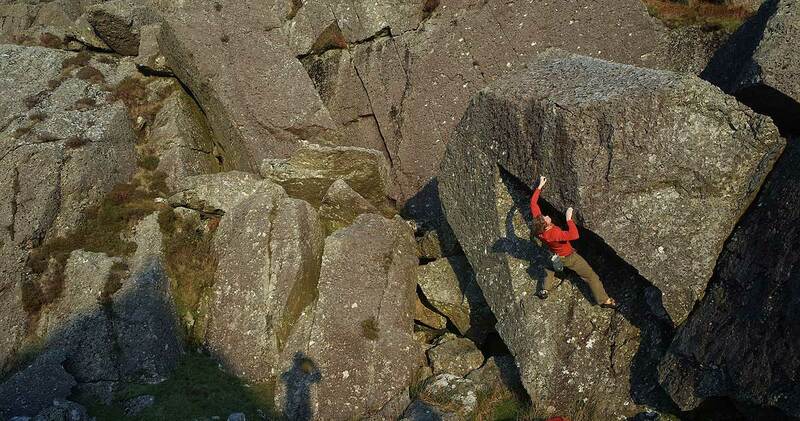 Around on the shadowy side of the boulder are some much harder problems. On the right side of the Dark Side corridor is a neat little slab. The right arête of the slab, climbed on its left side is very friendly. The central line on the slab is well endowed with positive holds. At the top of the Dark Side corridor there is a steep face. Over in the upper central section of the boulder field, just below the crag proper there is an attractive wall. At the base of the crag, just up to the left, there is an alcove. 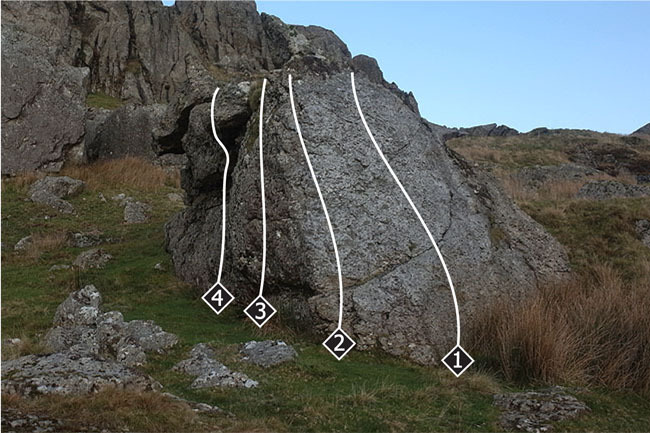 Climb out from the right side of the alcove to gain the diagonal ledge system. 8m down to the left are more good problems. 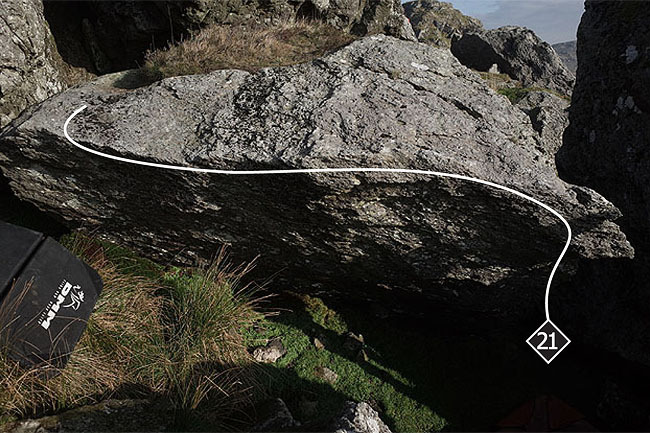 Through the gap is a severely undercut boulder with a slopey lip. 8m down to the left is another interesting cluster of boulders. 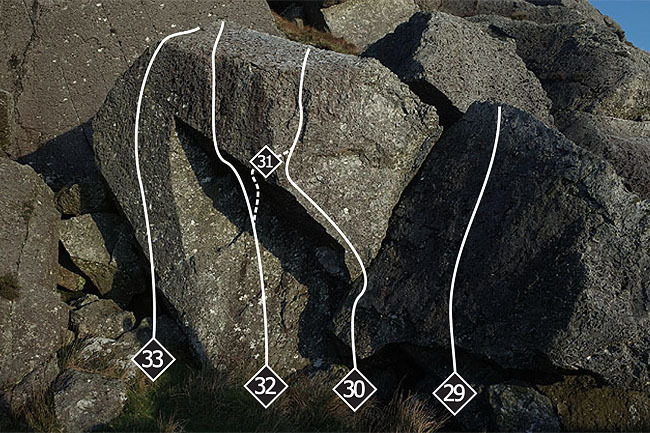 The right arête of the boulder is short and sweet. Climb the slab just right of centre on positive holds. Up behind Problem 26 is another worthwhile problem. Back down below and 8m in front of the Problem 26 area there is a long low boulder. Traverse the long low wall left-to-right, keeping your hands below the top; surprisingly tricky! 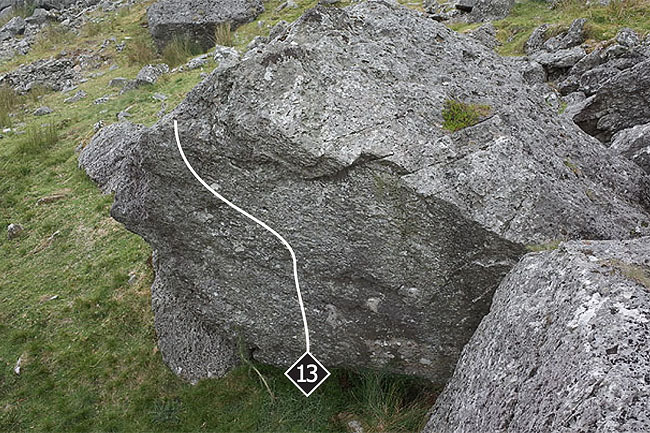 The next section can be found 150m round to the left at the base of the back crag. 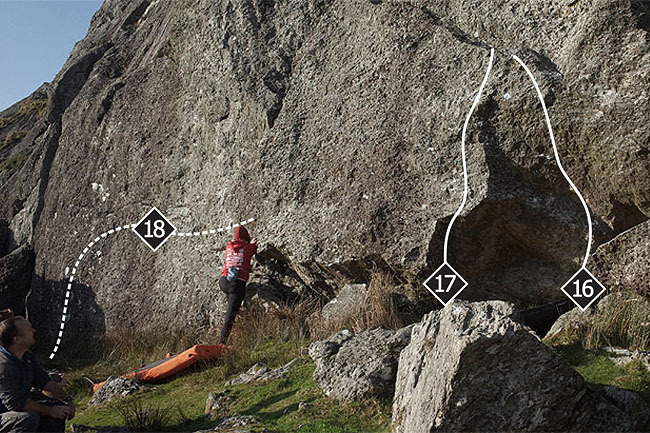 An impressive highball block catches the eye and provides some of the best problems here. 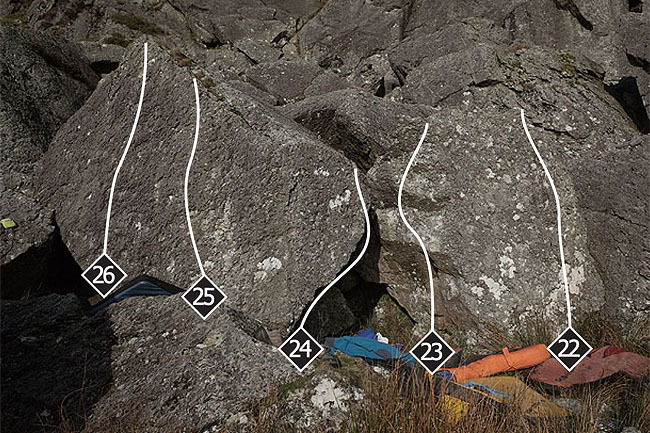 Make a tricky transition onto the hanging slab and pick your way easily to the top. If you scramble up the gully to the left of the Hongian block you will reach a steep arête on a leaning pillar. 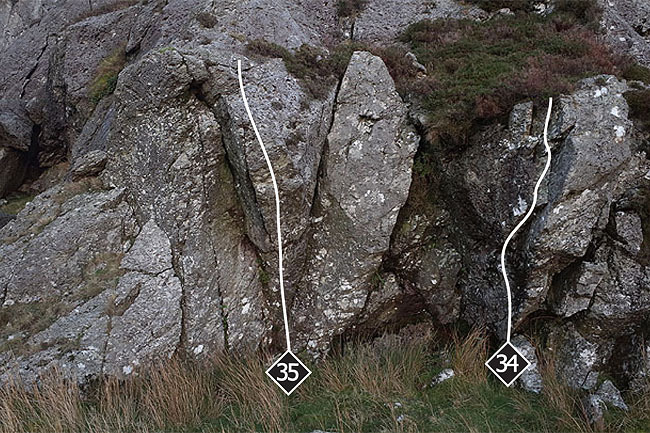 This gives a scary highball problem (6B! from a sit down start) requiring great care. At the top of the gully behind the pillar there is a highball wall on an upper level – there are some good but similarly scary lines here. Back down at ground level and 10m to the left of the Hongian block there is a small bay with a couple of problems. Farther left again is an obvious undercut block. Up behind this boulder there is a hanging block with an obvious eliminate project on its right side and a 5A sit down start on the upper left facet.